Hi friends! Remember some time ago (almost a year ago!) 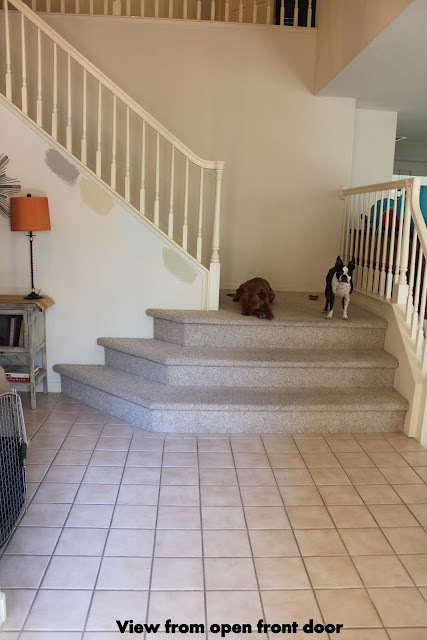 when I shared an e-design board I created for a client's entryway? 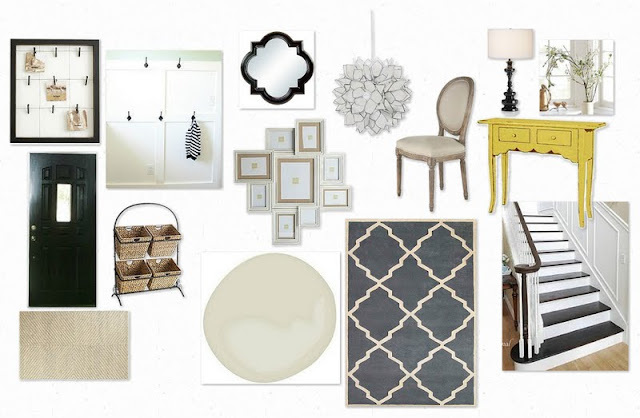 I created a casual chic room that combined comfort and a whole lot of function. Here's the design board I created. 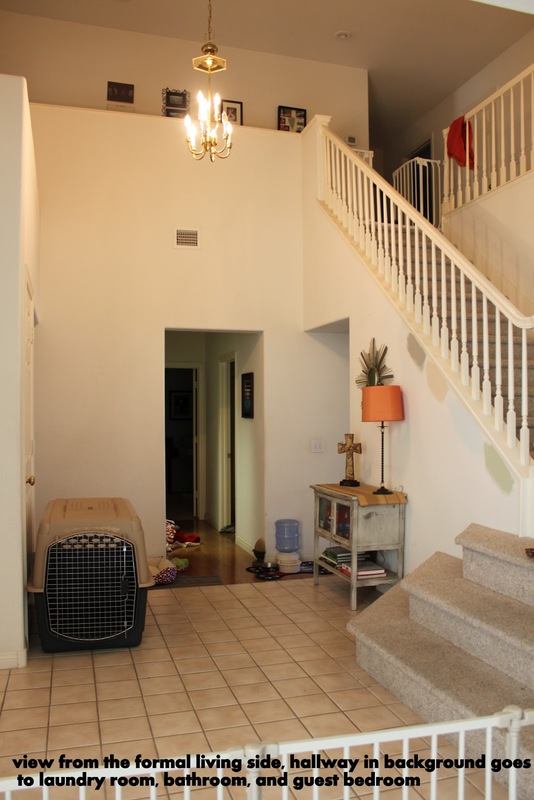 And I'm sooo excited to share before and after pictures of this room now with all of you! The entry space before the e-design board was implemented. And after? My client did a fantastic job of implementing so many of the designs on the board. She hasn't yet refinished the stairs or painted the front door black, but those are still on her to-do list. Check out the rest of the room, though... it looks amazing! That board + batten treatment is divine. As part of my e-designs, I provide clients with an extensive source list and (if you're up for it!) a full DIY tutorial for any DIY suggestions I make. I certainly gave her a full tutorial for the board + batten treatment; hopefully my suggestions really helped her as she made over the space. I think she did an amazing job executing the design, don't you? If you're interested an e-design for any space in your home, feel free to shoot me an email to ask about current lead times and rates! Amazing! 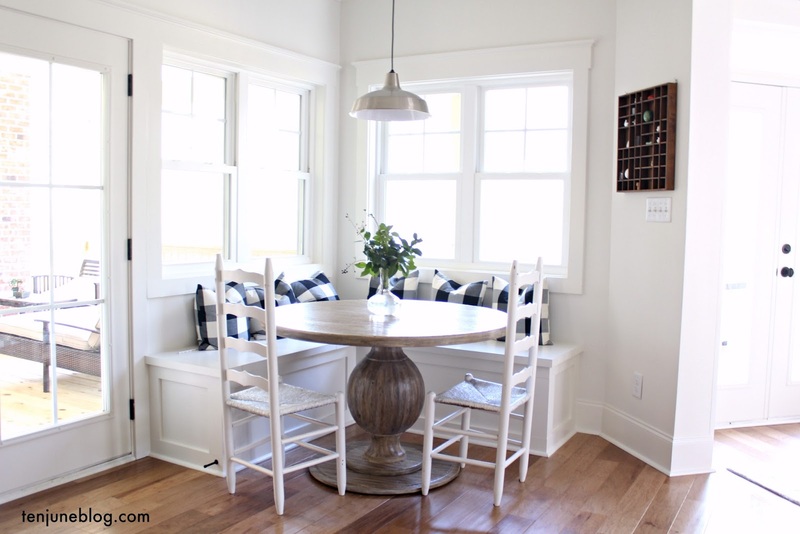 I love the yellow table and of course the board and batten! Nice work! I love the yellow table and the panelling on the wall. Great Work Michelle! Always fun when your work comes to life! it looks so good! the yellow table is my favorite part! Love it!! Amazing job Michelle! Love the batten wall!! Such a great idea! She did an awesome job implementing your design! Oh wow that space looks so pretty! The board and batten wall looks wonderful and it's so functional. Well done! Looks fantastic and I love the yellow table. Great job. Such a good job!! I love when clients execute well like that! :) Beautiful design, M.
Nice! I love that yellow console table! How cool to see your ideas come to fruition! She did an amazing job -- QUITE the difference! Well done. Love the change the rug makes. Wah-Whoa-We-Wah!!! Looks so so good....great ideas, and perfect execution!! What color is that on the walls? It's a perfect green for such a large space!